First 300 copies on exclusive indie coloured vinyl. Shana Cleveland has been beguiling listeners for years in her role as the superlative frontwoman for elastic surf rockers La Luz. 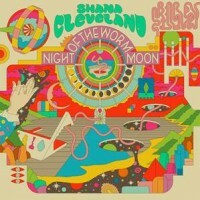 Now Cleveland is evolving her sound on the new solo full-length Night of the Worm Moon, a serene album that flows like a warm current while simultaneously wresting open a portal to another dimension. As much a work of California sci-fi as Octavia Butler’s Parable novels, Night of the Worm Moon incorporates everything from alternate realities to divine celestial bodies. Inspired in part by one of her musical idols, the Afro-futurist visionary Sun Ra (the album’s title is a tip of the hat to his 1970 release Night of the Purple Moon), the record blends pastoral folk with cosmic concerns. Cleveland dreamt up this premise while living in Los Angeles, a city where--as deftly explored on La Luz’s recent Floating Features--reality and fantasy casually co-exist. Abetting Cleveland during the recording process was a familiar gallery of co-conspirators: multi-instrumentalist Will Sprott of Shannon & the Clams, original La Luz bassist Abbey Blackwell, Goss, pedal steel player Olie Eshelman, and Kristian Garrard, who drummed on Cleveland’s previous solo effort (with then-backing band The Sandcastles), 2011’s Oh Man, Cover the Ground. Patrick says: Inspired by Sun Ra (in terms of outlook rather than style) La Luz frontwoman Shana Cleveland lets the incense burn and the breeze drift in on a gorgeous LP of stargazing folk. Softly psychedelic and bittersweet, "Night of The Worm Moon" reframes the Laurel Canyon sound for 2019.